"You went 12 full months while ISIS was on the march without the U.S. using that air power and now as the pilots come back to talk to us they say three-quarters of our ordnance we can’t drop, we can’t get clearance even when we have a clear target in front of us," Royce said. "I don’t understand this strategy at all because this is what has allowed ISIS the advantage and ability to recruit." "The bottom line is that we will not stoop to the level of our enemy and put civilians more in harm's way than absolutely necessary," the official told the Washington Free Beacon, explaining that the military often conducts flights "and don’t strike anything." "The fact that aircraft go on missions and don't strike anything is not out of the norm," the official said. "Despite U.S. strikes being the most precise in the history of warfare, conducting strike operations in the heavily populated areas where ISIL hides certainly presents challenges. We are fighting an enemy who goes out of their way to put civilians at risk. However, our pilots understand the need for the tactical patience in this environment. This fight against ISIL is not the kind of fight from previous decades." "This has been an absurdity from the beginning," Keane said in response to questions from Royce. "The president personally made a statement that has driven air power from the inception." "When we agreed we were going to do airpower and the military said, this is how it would work, he [Obama] said, ‘No, I do not want any civilian casualties,’" Keane explained. "And the response was, ‘But there’s always some civilian casualties. We have the best capability in the world to protect from civilians casualties.’"
However, Obama’s response was, "No, you don’t understand. I want no civilian casualties. Zero,’" Keane continued. "So that has driven our so-called rules of engagement to a degree we have never had in any previous air campaign from desert storm to the present." "Believe me," Keane added, "the French are in there not using the restrictions we have imposed on our pilots." And the same goes for Russians, he said, adding, "They don’t care at all about civilians." The French have been selecting their own targets since beginning to launch strikes on the Islamic State earlier this week, according to a second Pentagon source who spoke to the Free Beacon earlier this week about the strikes. France dropped at least 20 bombs on key Islamic State targets within two days after the terror attacks in Paris that killed 129. 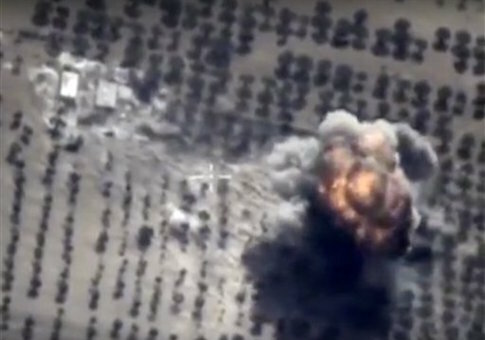 French strikes have killed at least 33 Islamic State militants in the past several days. In the case of the initial French strikes, the "targets were nominated by the French whose strikes against them were supported by the coalition" fighting the Islamic State, the official explained. Any coalition member can nominate a potential target. "Once a target is validated, great care is taken—from analysis of available intelligence to selection of the appropriate weapon to meet mission requirements—to minimize the risk of collateral damage, particularly any potential harm to non-combatants," the official said. Since the beginning of the year, more than 22,000 munitions were dropped on Islamic State targets during more than 8,000 sorties, according to information provided to the Free Beacon by the Defense Department. Some experts questioned whether the administration is handing off portions of the battle to other nations. "The French airstrikes have been billed as a significant uptick in the battle against the Islamic State; preliminary data indicate that this is not the case," said Jonathan Schanzer, a former terrorism expert at the U.S. Treasury Department. "It appears that the U.S. is simply allowing France to strike many of the targets that would usually be reserved for the U.S. and some of its coalition allies. In other words, this appears to be a redistribution of daily targets in the ongoing campaign, and not a significant change." These strikes have forced the Islamic State to evacuate at least 20 to 25 percent of the territories it held one year ago in both Iraq and Syria, according to the Pentagon. Attacks have focused on the Islamic State’s "staging areas, fighting position, and key leaders," as well as its "oil distribution chain," according to the Pentagon. Meanwhile, a poll released Thursday found that at least 70 percent of American support an expanded fight against the Islamic State, including sending U.S. troops to the region. This entry was posted in National Security and tagged Islamic State, Obama Administration. Bookmark the permalink.